The world of smartphones is constantly moving forward, with a never-ending parade of improvements and upgrades. A year on from Apple’s biggest overhaul of the iPhone range and we have a direct successor to the iPhone X. Clearly part of the same family, with a notched OLED screen and all the same design cues, we find the iPhone Xs vying for our affections. Owners of an iPhone X will be weighing up whether the upgrade to an iPhone Xs is worth it. Others may be anticipating a price drop for the iPhone X and wondering if the iPhone Xs justifies the extra outlay. We have all the answers you need right here as we compare last year’s iPhone X with this year’s iPhone Xs. The most notable thing here is the upgrade to Apple’s latest A12 Bionic processor. This new chip is faster and more power-efficient than its predecessor, the A11, which you’ll find in the iPhone X. Apple suggests it’s 15 percent faster and 40 percent more power-efficient. There’s also an improved Neural Engine in the A12 Bionic, along with augmented reality and graphical improvements that should please gamers in particular. We’re not sure how much the extra speed will be felt right now, since the iPhone X will comfortably handle anything you can throw at it, but as more demanding apps and games are released to take advantage of this jump in raw processing power, we will see a gap. Apple also suggests that apps will load up to 30 percent faster on the iPhone Xs. We also expect to see significantly better battery life in the iPhone Xs, and Apple suggests it should last half an hour longer per day on average, though it didn’t reveal the capacity. You can fast charge the iPhone X if you snag a fast charger, but charging speeds, both slow and fast, are going to be similar for these phones. Both iPhones also support Qi wireless charging. You’ll be hard-pressed to tell these phones apart. As is tradition with an S upgrade, the body of the iPhone Xs is identical to the iPhone X. We’ve got the same glass sandwich design with a notch cut into the top of the 5.8-inch OLED screen. However, while you can get both in space grey or silver, only the iPhone Xs comes in gold. 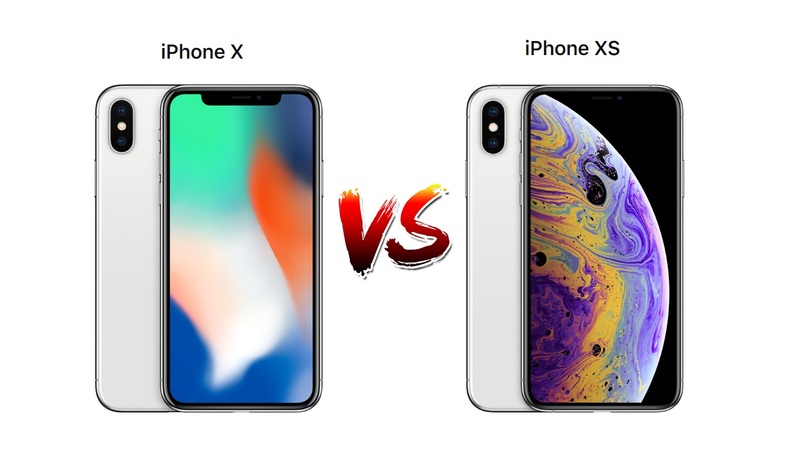 A case is going to be a necessity for either of these iPhones, so check out the best iPhone X cases and the best iPhone Xs cases for some ideas. The iPhone Xs is covered in tougher glass, so it may fare a little better in a fall. Water won’t be a major concern for iPhone X owners because it can be submerged in shallow water — up to a meter deep — for up to half an hour without damage. The iPhone Xs has a slightly higher IP68 rating that means it can handle depths of up to 2 meters for the same period. There’s nothing to separate the iPhones here, because both sport the same 5.8-inch OLED screen with a 2,436 × 1,125-pixel resolution. They’re sharp, bright, and boast accurate colors. The aspect ratio is 19.5:9, so this is a wide screen, though that distinctive notch cuts out a portion of it. The screen-to-body ratio is still one of the highest around at 82.9 percent. We’ve been impressed by the dual-lens camera in the iPhone X, and Apple stuck with the same setup in the iPhone Xs. You’ve got two 12-megapixel lenses, both with optical image stabilization (OIS), but one has an f/1.8 aperture while the other has an f/2.4 aperture and supports 2× optical zoom. It’s capable of capturing great shots in a wide variety of different situations, though it doesn’t match some competitors when it comes to low-light photography. Something it is very good at is capturing great portrait shots with blurred backgrounds, and the iPhone Xs allows you to adjust the depth of field after taking a shot. Apple claims the sensor in the iPhone Xs is twice as fast, so we expect to see some improvements when we get to take it for a test drive. The front-facing camera has the same TrueDepth support, which enables the FaceID to work so securely and also allows Animojis and Memojis to work so well. Apparently, the iPhone Xs has a faster Secure Enclave and an algorithm update, which means FaceID should work just a little faster in the newer phone. The Apple iPhone Xs launches with the iOS 12 operating system on board, while the iPhone X launched with iOS 11, however the iPhone X can be updated to iOS 12 very easily. Apple rolls out updates regularly, and both these iPhones will be easy to update over-the-air. The software experience and update schedule should be identical for both these phones, but we’re going to give the newer iPhone the slightest of edges, because it will likely continue to get updates for slightly longer than its predecessor. If we look at iOS 12, for example, we find that the iPhone 5S is the cutoff line and the iPhone 5 won’t be getting it. When Apple releases a new iPhone. last year’s model drops in price. The base model of the iPhone Xs with 64GB of storage is going to cost you $1,000 and it will be widely available September 21, with pre-orders starting from September 14. The iPhone Xs replaces the iPhone X on Apple’s website, but you should still be able to pick it up from major retailers or from any big carrier. We expect the price to drop a little in response to the release of the iPhone Xs, so watch out for deals. It will come as no surprise that Apple has made improvements over the last year and the iPhone Xs is a slightly better phone than the iPhone X. It boasts better performance, longer battery life, and a few other tweaks to make it more appealing, but the difference isn’t massive. If you have an iPhone X already, we think you should hang to it on for at least another year. For those choosing between the X and the Xs, we’d definitely opt for the newer iPhone.